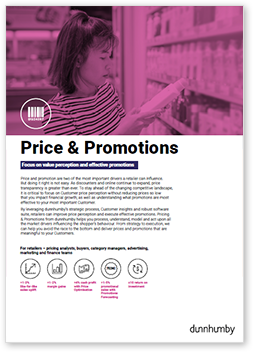 Pricing & Promotions from dunnhumby helps you process, understand, model and act upon all the market drivers influencing the shopper’s behaviour. From strategy to execution, we can help you avoid the race to the bottom and deliver prices and promotions that are meaningful to your Customers. A retail solution that can achieve top-line sales growth of 1-3% and margin gains of 1-2%. How do I drive a strong price-value perception for my best Customers? How can I better manage weekly price changes, competitive prices and efficiently react to routine cost changes? Which competitors are most relevant to my Customers and how should this be reflected in my price & promotions strategy? dunnhumby Price & Promotions solutions leverage a modular framework of pricing and promotional tools and services driven by proven Customer Data Science and best practices. "Optimising the first 10 categories with PriceStrat resulted in +4.1% increase in gross margin, 1.5% in sales and 0.9% increase in units." "Using the dunnhumby PriceStrat tool, we now have the ability to model prices and promotions across Customer segments, to make sure we deliver a superior shopping experience."